Oh my God, it's the end of the month already? Hell I thought there was one more day. That's what happens when your birthday is on the 28th. You're still hung over on the 30th! There, did I make you smile? That's the theme of this month's photo challenge from P.J. Now, let's see, what made me smile this month? How about my grandson, Miko, who we took out for breakfast after his hockey game. He has a whole different concept when you ask him to "smile" for a picture. This is the other side of the Louis-Hippolyte Lafontaine Tunnel in Montreal. It goes under the St. Lawrence River. It's a little disconcerting to see water dripping down throughout the tunnel. It gives Mrs D fits. But she was driving and I was...smiling. There was just something photogenic about this guy at the Montreal Planetarium. He was smiling. At leafs I think that's a smile. Can you imagine how much toothpaste this guy would have to use. That thought made me smile. 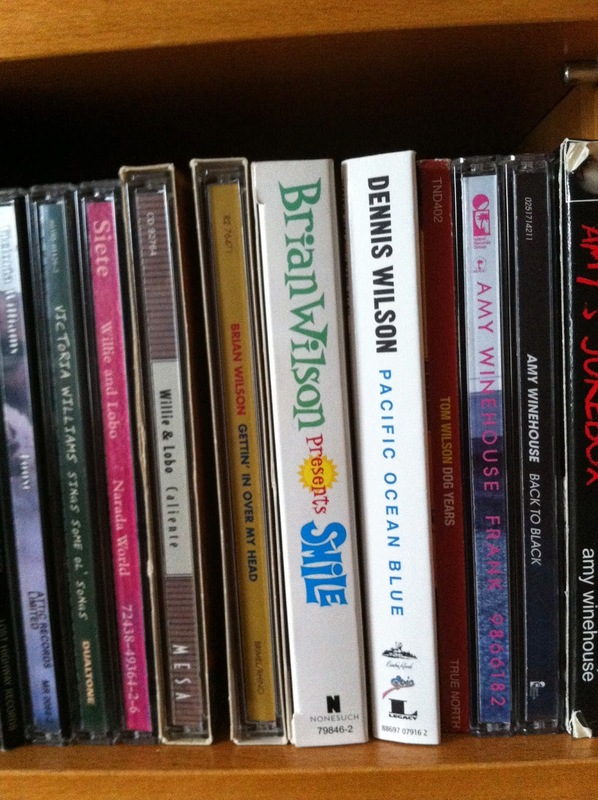 In the middle of this picture is a CD by Brian Wilson called "Smile". There's a bit of a history to this CD. Wilson started work on it in 1966. It was to be the next Beach Boys album after Pet Sounds. Wilson's instability via mental illness and drugs is well known. The project was never completed...until finally in 2004 Wilson got it together, literally, finished the album with the help of Van Dyke Parks and released it. It won a Grammy. I don't know about you but I like a good horror story from time to time. Things that go bump in the night, monsters under the bed and all that. Lucky for me my monsters under my bed are happy monsters. 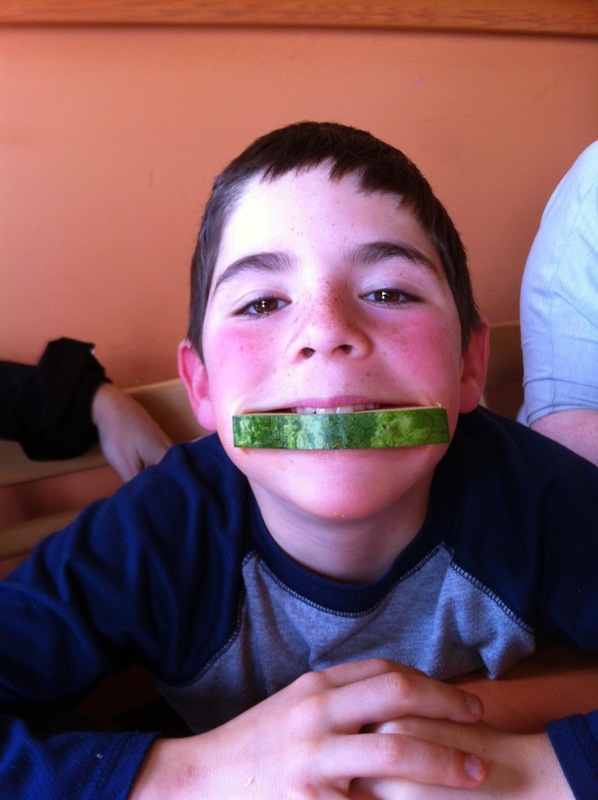 What is the green stuff in your grandson's mouth? A boy after my own heart and it makes me a tad nervous when I see water trickling down into a tunnel as well as your wife! It's a slice of watermelon, Babs. I also have a pic of him with an orange slice. That tunnel was most disconcerting. We went through it twice! Cool photos. I haven't been through that tunnel in YEARS, but now I don't have to. And I'm a sucker for dinosaur skulls. I should pay the new planetarium a visit. We hit that tunnel on the way to and from Victoriaville for Easter. That dinosaur looks like my cat. Well, not quite. The cat doesn't like watermelon and he certainly isn't smiling. Nice job on the photos! Your selection definitely made me smile today! I love your grandson's interpretation. You're cat's dead and all you're left with is its head?? Well at least breakfast was peaceful this way! Those are great examples for the prompt. Your grandson has the sweetest face. That picture is too cute for words. When he and his younger twin brothers get together look out! I was wondering whether someone was going to post a shot of someone with an orange in their mouth and you did one better and got a slice of watermelon to resemble a smile. Then, I look below and see you've also posted an Orange bonus shot. Well done. Ha ha ha happy monsters under your bed!!! 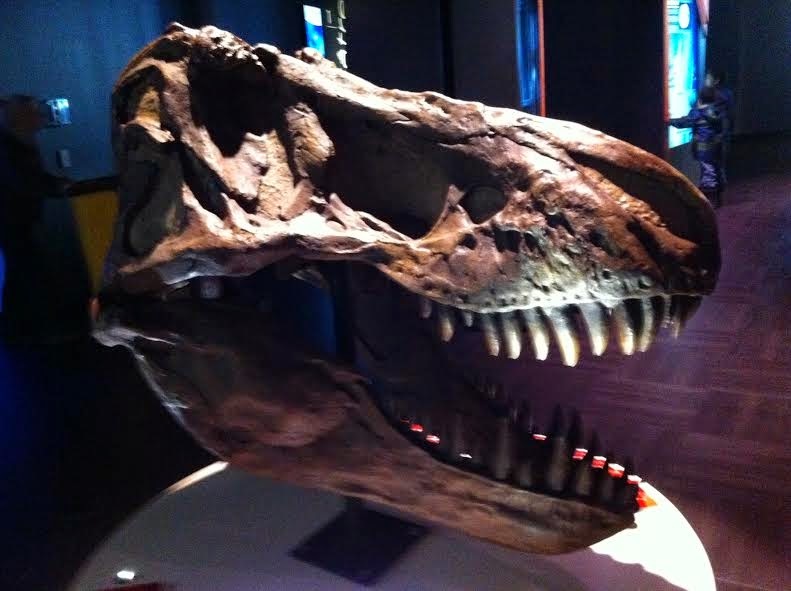 That dinosaur sure knows how to smile. Bet he had huge dental bills!!! Miko knows how to smile!!!! I liked the watermelon shot over the orange shot. My little one is quite a character and a fantastic hockey player! I couldn't pass up using that dinosaur pic. Amazing, isn't it? Most excellent representations of smiles! That dinosaur is tops, IMHO. And the monster under the bed? A very close second. Way to go! I kinda liked that monster under the bed. Much better than when I was growing up.